Described by Jervoise as 'magnificent', this possibly Tudor bridge is situated about 400m south of Lanercost Priory, which was dissolved circa 1543. The bridge is a Grade II listed structure. With two arches spanning 20m, the total span of the bridge is almost 46m. The deck is some 3m wide between the solid masonry parapets either side, the triangular cutwaters of the central pier being carried up in three stages to parapet level where they form pedestrian refuges. The voussoir rings of the arches are in three orders. The arches are almost four centred in shape. 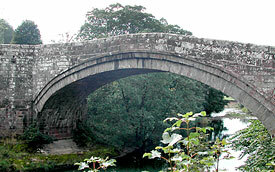 The bridge was repaired or rebuilt in 1724. Protective work to the pier foundations was carried out several times during the 19th century. It is now bypassed by a modern concrete bridge.